This pattern was scribbled down in my practice notebook as one of my very first drum lessons. I still run through it on a practice pad back stage before a show as part of a stretch and warmup routine. Accent the first stroke of the bar, descending through 8 strokes down to 1. Make sure you repeat the cycle without stopping. The double stroke version is a more recent addition I made. The accented notes shift position between the first stroke of the double and the second stroke. It might take some getting used to. 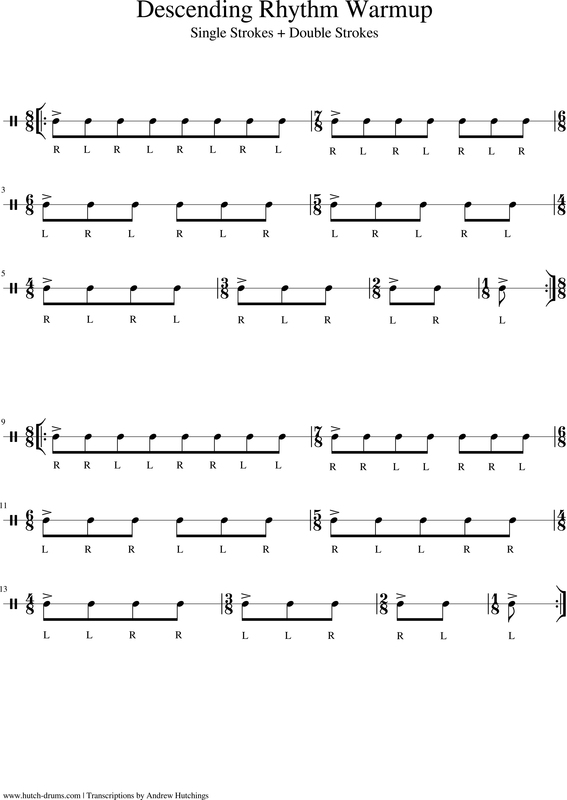 Of course you can continue on and apply any sticking pattern to this descending accented cycle. Easily committed to memory, I find these to be a valuable warmup tool. If this exercise is sourced from a particular book that I’m unaware of, let me know.